Westiva is very casual, informal event originally geared towards owners, fans and fanatics of both the Ford Festiva or Ford Aspire with invitations extended to owners of other econoboxes from the late eighties and early nineties such as the Dodge Colt, Chevrolet Sprint, Geo Metro, Suzuki Swift and Nissan Micra. The "official" start time is around 10:00am. 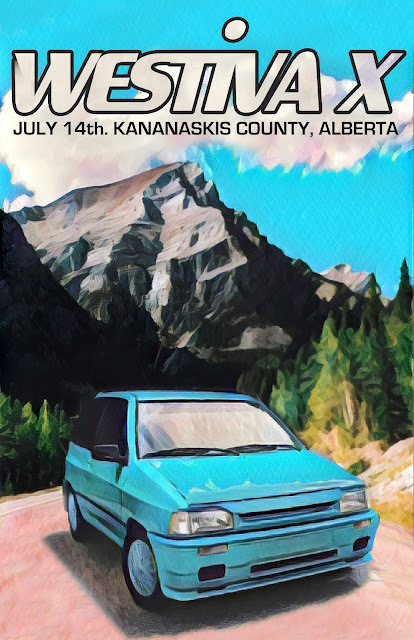 At about 1:00pm we cruise up to the Boulton Creek Trading Post in Peter Lougheed Provincial Park for ice cream, about a 30km drive. From there we'll continue to Upper Kananaskis Lake. When Westiva was first held in 2008 there were four attendees. 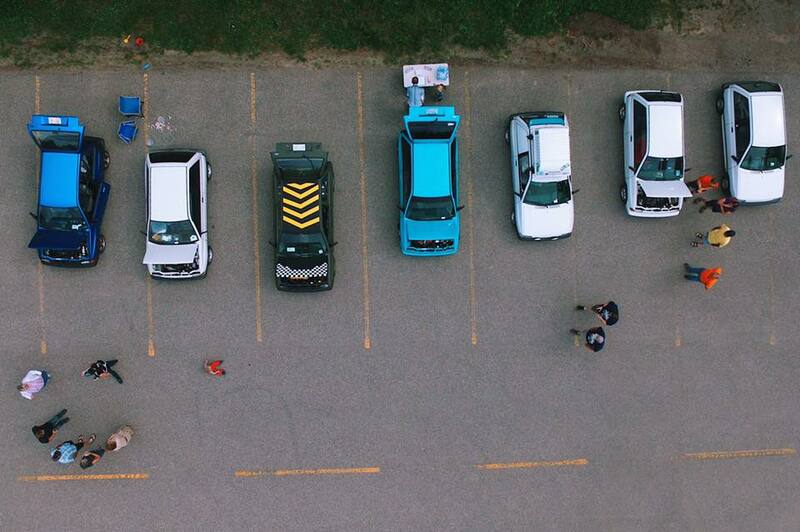 Two from Calgary, one from the lower mainland of British Columbia and the fourth driving up from Worland WY. Our best year attendance-wise was 2010 when we had 10 Festivas show up with the furthest being from Ontario. 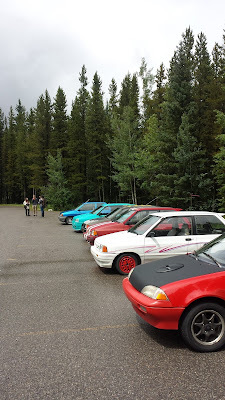 The 2014 event saw a couple of Suzuki Swifts in attendance, one from Calgary and the other from Spruce Grove AB. We also had owners bringing the cars from as far away as Pasco WA and St. Albert SK. The 2016 event turned out to be a cool and rainy one but in spite of that we had five Festivas make an appearance, myself and four other first time attendees! There was also a Suzuki Swift convertible to round out the number to six. Campgrounds in the area fill up fast so I would recommend making reservations. Some campgrounds are first come, first served but others can be reserved 90 days in advance. Mount Kidd RV Park is the closest, and nicest, but there are a couple of other options that aren't too far away. Those would include Eau Clarie just south of the venue along with a number in Peter Lougheed Provincial Park. Another camping option would be in Bow Valley Provincial Park, about 40 minutes away on Highway 1 towards Canmore. As for hotels the closest are located in Kananaskis Village, not far from Wedge Pond. Calgary's western city limits are only about an hour or so away from Wedge Pond. There are a number of hotels on that side of town as well. If you search "Motel Village Calgary" you will find a number of places to stay that are conveniently located along Highway 1, the Trans Canada Highway, as it passes through the City. I live not too far from there so perhaps an early morning caravan could be set up to make our way to the venue. There are a couple of hotels right across the highway from Canada Olympic Park, the site of a number of events in the 1988 Winter Olympics. Those are the Sandman Hotel & Suites Calgary West and the Four Points by Sheraton Hotel & Suites Calgary West. One thing to keep in mind that Westiva is held during Calgary's Stampede week and hotels could possibly book up fairly early in the year. I recommend booking sooner than later. Westiva 2010 attendees. One more arrived after this photo was taken. 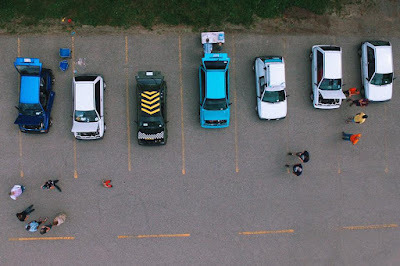 Westiva 2010 attendees at Upper Kananaskis Lake parking lot. Westiva 2014 attendees, including a Swift or two and a Kia Sportage! Westiva 2016 attendees, including a Suzuki Swift convertible! Looking forward to some long distance attendees this year! 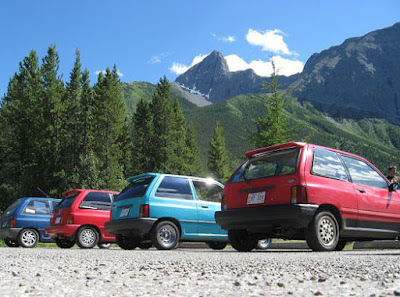 Festiva owners in Georgia, Utah and Kentucky made the trip up last year. If the exchange rate on the Canadian vs. US dollar stays anywhere close to where it is today it would make for an inexpensive trip! After much thought Sharon and I have decided that this year's edition of Westiva will be the last one we'll be hosting. We hosted the first edition back in July of 2008 and have done so every year except one since. Over the course of time we have met many fellow Festiva fanatics and have made many friends as a result. We will be working towards making this years edition of Westiva the biggest and best to date. It will be at the same venue with the same activities with perhaps a couple of other exciting things thrown in the mix. There is something special that we'll be looking at as an add on either the day before or the evening after the "official" get together. Who: Ford Festiva and Aspire fans and anyone interested along with owners, fans etc of other econoboxes from the era. Why: Why not? There may even be prizes and trophies! "Remember not to be a fool"